It the day we’ve all been waiting for! Today Apple unveiled three new phones, the iPhone 8, iPhone 8 Plus, and the innovative, premium iPhone X. The iPhone 8 and iPhone 8 Plus include several awesome upgrades from the 7 and 7 Plus before them, including improved cameras and wireless charging. However, the star of the show is the iPhone X, which is a huge step forward for Apple. It has an edge-to-edge screen, facial recognition to unlock the phone, and portrait mode cameras on the front and back. Speck’s Presidio cases for the iPhone X, iPhone 8 and 8 Plus are available now. Each offers protection up to 10 feet with a slim design that doesn’t take away from these beautiful devices. The iPhone X boasts an OLED screen that stretches from one edge of the phone to the other. It’s innovative for Apple, which has historically created the iPhone with large bezels around the top and bottom of the display (which you’ll still see on the iPhone 8 and 8 Plus. Now you’ll get to enjoy more screen space without needing a larger phone. No bezel means this screen will need more protection. Luckily, our Presidio cases have a raised edge around the screen to protect during a drop and when your phone is lying face down on a table. Something that Samsung has had for a few years finally arrives on the iPhone! You’ll be able to charge your new iPhone X, iPhone 8, or iPhone 8 Plus wirelessly by placing it on a charging pad, rather than plugging in a cable. Unfortunately, you’ll have to buy a charging mat separately. In lieu of a Touch ID home button, the iPhone X uses facial recognition to unlock the phone. The new technology is called Face ID and is backed by lots of internal processors and technology to make it safe and powerful. According to Apple, the technology won’t be duped by masks, photos, or other fake faces. The iPhone X, iPhone 8 and iPhone 8 Plus come with AR capabilities so that you can interact with the real world in new ways. You’ll be able to play games where it looks like the characters are in the real world, or point your camera at the sky and see a star map. Augmented reality also comes into play with Animojis on the iPhone X. These are animated emojis that you can control with your face. The iPhone X has the same dual-lens camera arrangement as the iPhone 8 Plus, but it gets Portrait mode on the front-facing camera as well.There’s also a new Portrait lighting mode, for professional-grade lighting effects on your photos. This all means your selfies will look almost like a pro photographer took them. The new iPhones ship with iOS 11, the latest version of Apple’s mobile operating system. The updated OS has a streamlined look, improved suggestions from Siri, the ability to pay friends with Apple Pay, and many other features. And if you’re not getting the new phones, you’ll be able to upgrade your existing iPhones to iOS 11 on September 19. The full Presidio line for iPhone X. Already ready to preorder the new iPhones? Speck’s Presidio cases are available right now for the iPhone 8, iPhone 8 Plus, and iPhone X. 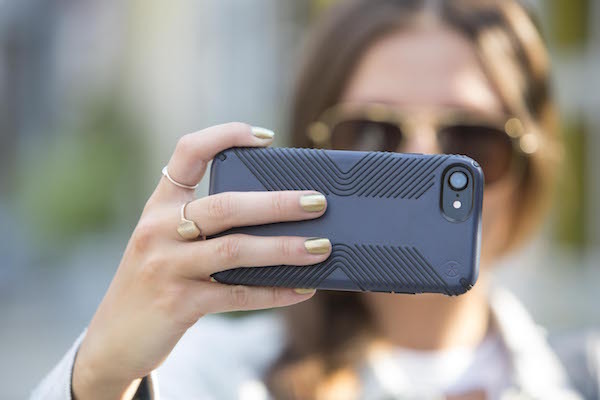 Whether you want to show off the new phone with a dual-layer Presidio CLEAR case or make sure it doesn’t slip out of your hands with Presidio GRIP, we’ve got you and your new iPhone covered. The iPhone 8 and iPhone 8 Plus are available for pre-order on September 15, but you can purchase a Presidio case for the new phones now on Speck’s website. Excited for the iPhone X? You’ll have to wait to preorder in October, but you can get cases today.